It is our pleasure to welcome all of you to the MyShadi Bridal Expo, which will give you a hands-on approach to wedding planning. Over 100 wedding professionals are on hand in an elegant layout designed to create an ambiance of splendor. For the first time ever at this Expo, mehndi and make-up artists will be doing live demonstrations to give brides ideas of looks for their wedding day. These live demonstrations will occur once an hour and are truly a unique way for brides to get excited about their special day. Get ready to be dazzled by two unique fashion shows that will highlight the latest trends in wedding and formal fashions. A wide range of event planning vendors are on hand to showcase their products and services. Mandaps and reception table settings are on display to guide brides and their families in their wedding planning decisions. Photographers are available to present their work and discuss their style, which is sure to put couples and their families at ease. Caterers and bakeries are offering guests delectable samples. Guests will even be able to shop on site for clothing, jewelry, and accessories. .
MyShadi Bridal Expo welcomes the opportunity to work with our Platinum Sponsors: Hilton Orlando, Occasions by Shangri-la, TV Asia, Qatar Airways and The Arpan Group. 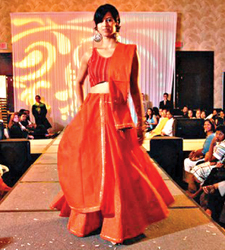 Le Trend Boutique is an Indian clothing boutique based in Central Florida. Established in 2006 by Farzana Manekia who is of Indian origin, born in East Africa and has traveled and resided in different parts of the world. When Farzana moved to Central Florida, from New York, in 2005, she saw a demand for designer Indian clothing and custom bridal wear. 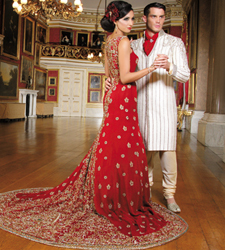 Her collection ranges from casual to formal wear, sarees, children clothing, men’s wear, and accessories. Le Trend Boutique specializes in Custom Bridal Wear. Outfits, Saris, & Lengas can be customized by selecting appropriate fabric, work, design and color to suit ones preference and budget. Coordinating Sherwani’s is available for the groom. From Bridesmaid outfits to putting together clothing for the entire family, Le Trend Boutique is a one-stop shop. 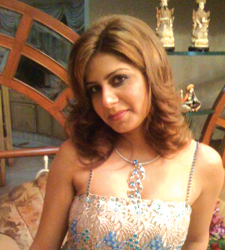 Originally hailing from beautiful Pune, India, Chandni Sakhuja, has always been on the vanguard of style and fashion. Be it in modeling, directing, choreography or dance, this savant of the fashion scene has has been seamlessly blending the exotic eastern styles of her beloved India with the contemporary fashions of the runways of the West, designing and manufacturing exclusive, custom-made outfits with the highest quality of workmanship and forward fashion sense for a select clientele group. Chandni is now sharing her vision and passion with you with the launch of ‘Chandnis Couture’ at the Desh Videsh bridal expo. Allow her to assist you with one of the most difficult and stressful aspects of the most important day of your life – your wedding. She will meet all your and your bridal party’s fashion needs from head to toe. A certified Esthetician practicing in South Florida for eight years. Year round she tends to weddings both large and small in many different Florida locations, including but not limited to: Tampa, Orlando, Miami, and Ft. Lauderdale. Make-up application, hair up-do, and mehndi are the services offered for the bride and bridal party, needless to say she will not stop there to help the bride experience the perfect wedding. Khairu is a professional mehndi (henna) artist, who just moved from New York and is now based in Tampa, Florida. She specializes in traditional bridal mehndi and has 10 years of experience. Her bridal mehndi designs are not only unique and elegant, but also based on traditional Indian mehndi, Arabic, black, color, henna tattoos, zardosi, and modern patterns. Khairu uses only natural mehndi (henna) powder and other natural herbal ingredients to prepare a quality mehndi paste. With this paste only 2-3 hours of wear is needed before maximum color is achieved. Available for all occasions like weddings, sangeet, coorporate events, company celebration days, and birthday parties, Khairu has a variety of designs in her portfolio from which to choose. Customized designs are also available. AISHA BEAUTY SALON is a Full Service Beauty Salon and Day Spa, located in Hunters Creek (Publix Shopping Plaza) Orlando, they offer a full range of services including Sauna Room ;Waxing: Full Body, Bikini & Brazilian Waxing; Hair Cut, Styling, Blow dry ;Hair Coloring / Highlights / Lowlights; Relaxers, Perms ;Hair Extensions ;Keratin Hair Treatment; Nails: Pedicure & Manicure, Shallac Manicure & Pedicure ;Massage Therapy: Swedish, Deep Tissue, Sports, Pregnancy; Facials: Deep Pore, Acne, European, Anti-aging & Signature Facials; Tanning ;Permanent Make-up; Bridal Makeup, Party Makeup & Hair, Updo’s ;Sweet Sixteen Makeup; Proms; Home coming Hair Makeup; Air Brush Makeup; Bridal & Engagement parties. They have created a relaxing and mellow environment just for you. Take your mind off the stresses of life and treat yourself to a pleasant and calming experience. Michele Renee is a lead artist with the Michele Renee Hair and Makeup Artist Group which is comprised of 20 talented artists specializing in Traditional and Bollywood Style makeup. We are located in Tampa Florida but will travel to any location nationwide. We use MAC airbrush makeup which makes your skin look flawless and high quality pigmented makeup like MAC, Makeup Forever, and NARS. With over 15yrs in the beauty industry, Michele Renee has become a prominent fixture in South Florida. She and her team of artists are passionate about their craft and will create a look for you that will complement your own personal style and accentuate your beauty on your special day.